Produced by Asia On Stage (AOS), DragonTales brings together the best creative minds of the Philippines and Singapore. Nine of its ten actors are a high-caliber cast of Filipinos, most of whom are the biggest names in the theater and television industry today: Kalila Aguilos, Banaue Miclat, Miguel Vasquez, Neomi Gonzales, Nar Cabico, Meann Espinosa, Lex Marcos, Carlon Matobato and Joel Molina. Playing the lead role (Miki) is Gani Karim, a multi-disciplinary performer, sought after choreographer and arts educator in his hometown Singapore. Besides boasting of a high-caliber cast, the show also features breathtaking Asian music, dance, drama and a rich text that displays various Asian values such as friendship, family, respect and love. An avant-garde production with a strong Asian sensibility and world-class appeal, this one-of-a-kind show also promises an array of outstanding musical numbers, fabulous costumes, spectacular dances and fight scenes of theatrical proportions. DragonTales is the coming of age story of a young man who needs to find himself. He embarks on a journey through his alter ego, a young impatient dragon, seeking his rightful claim to the dragon throne. Through the journey, he battles evil and digs deep within to find belief in himself. DragonTales is directed by Jeremiah Choy, a multi-awarded director who directed the critically acclaimed Machine for TheaterWorks, which won him Best Director in the 2002 DBS Life! Theater Awards. A perfect family entertainment, DragonTales will be surely enjoyed by the young and old. 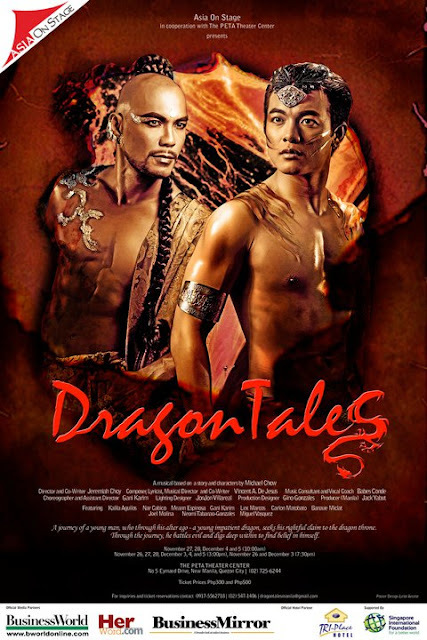 For advance reservations and bookings, please contact DragonTales Marketing at (632) 881-0984, +63917-5562718 or +63915-2957550 or dragontalesmanila@gmail.com.